Sheila Minor Huff was uncredited in this archival photo from the 1971 International Conference on Biology of Whales. 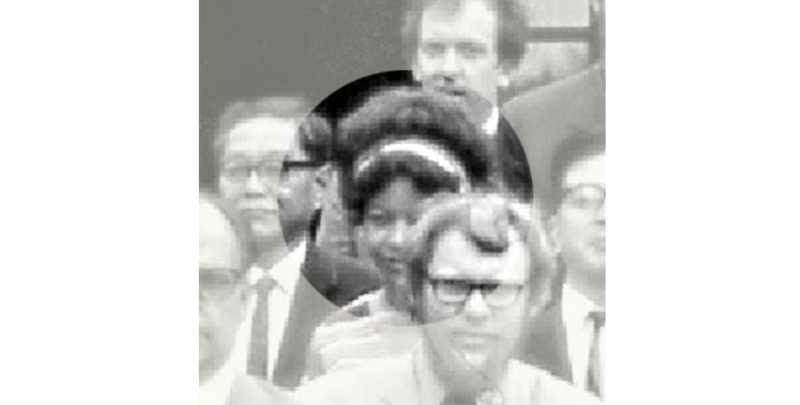 Last week, Twitter jumped on the case of an unidentified black woman who appeared, partially obscured, in a 1971 photo taken at the International Conference on the Biology of Whales. She was the only woman in attendance in a sea of mostly white men, prompting the person who found the photo—Candace Jean Anderson, an author working on a picture book on the 1972 U.S. Marine Mammal Protection Act—to ask the internet for help. As Anderson noted, everyone else in the photo had been named, except for the woman. The photo circulated widely on Twitter until it came across Dee Allen’s timeline. As the New York Times reports, Allen, who served as a research program officer at the Marine Mammal Commission, saw the photograph on Twitter and reached out to her mentors. “I figured it was probably something I could track down pretty easily, and I have an appreciation for the history of the field,” Allen told the Times. Among the people she contacted was Don Wilson, the emeritus curator of mammals at the Smithsonian National Museum of Natural History, who identified the woman in the photograph as Sheila, a museum technician at the Smithsonian. Allen sent Anderson the information, and Anderson tracked down Sheila on social media (the process was captured by Anderson in her full Twitter thread). As it turns out, the only thing more compelling than the story behind discovering Sheila is Sheila herself. Sheila Minor Huff, the Times reports, is now a 71-year-old retiree living in Virginia who volunteers at her church and belly dances. After graduating with a bachelor’s degree in biology, Huff began work as an animal technician. The job involves caring for animals in research and lab settings, including prepping lab samples, conducting field and laboratory projects, and reporting findings. Huff told the Times that when she first applied to work at the Bureau of Sport Fisheries and Wildlife, she was instead asked to work as a typist. “I said, ‘No, I went to school too long to be your secretary!’” Huff said. While working full time, Huff completed her master’s degree. A black woman working in a field where women and people of color are underrepresented and underacknowledged, Huff worked alongside top government officials on a variety of environmental and wildlife projects, earning her a GS-14 federal employee status with the Department of the Interior—the highest designation possible, the Times notes. It’s impossible to read Huff’s story and not think of the likes of NASA’s Katherine Johnson, Dorothy Vaughan and Mary Jackson, whose contributions to America’s space race were largely unknown until author Margot Lee Shetterly shared their story in her book, Hidden Figures. On the whole, the historical contributions of black women have been obscured or forgotten, with few exceptions. Huff, for her part, takes the omission of her name in stride.